1.1 How Much Water Will be Used? 1.2 How Much Time Will an Automatic Sprinkler System Save Me? 1.3 Why Not Just Wait for it to Rain? 1.4 How to Operate My Irrigation System? 1.5 What Type of Sprinklers Should I Use? 1.6 What Time Should I Water My Lawn? 1.7 What Happens If I Don’t Water My Lawn Correctly? 1.8 What Are the Most Common Lawn Irrigation Components? 1.9 What is a Monthly Sprinkler Irrigation Maintenance Checklist? Here in the Orlando area, sprinkler repair is a big business because most new homes come with a lawn irrigation system pre-installed in Central Florida. For those of you new to running a sprinkler systems here are some frequently asked questions. If you need professional help we have a Lake Mary office and Sanford office to help you. Your system can water in the early morning hours when the evapotranspiration rate and wind speed is lower and you are still asleep. A rain sensor will keep your system from operating when it is raining, saving water costs. You can even have your own “weather station” built into your “smart sprinkler system” so it only turns on and waters when your turf and landscape need it. How Much Water Will be Used? Of course that depends on the size of the area, amount of turf vs. Landscape plants, shade vs. Sun, soil type and other factors. However it is safe to say that a properly installed irrigation system will water your property with far more efficiency than could be done with a hose. Syringe cycling and correct head spacing will reduce run-off as well as over/under watering. This means your yard gets the right amount of water at just the right time. How Much Time Will an Automatic Sprinkler System Save Me? I prefer to think of it as how much freedom you will gain. No more worrying about irrigating the grass while the Big Ball Game is on TV. Go out of town on vacation or business without the worry of irrigating the garden. Not only that, you will have the peace of mind knowing that every part of your property is receiving precisely the amount of water it needs. Why Not Just Wait for it to Rain? Unless you can get it to rain on your scheduled watering day for precisely the right amount of time for each individual part of your yard, you won’t get the exacting precision of an automatic irrigation system. When the summer rainy season here in Central Florida goes away in October, lawns all over Orlando start to dry out. In the Spring, low humidity and high temperatures kill turf all over FL. How to Operate My Irrigation System? All automatic irrigation systems have a controller. Each brand of sprinkler timer works differently. Luckily in the age of YouTube you are sure to find an online video that shows how to program your particular device. You can also search Google by brand and model and download the instruction manual. What Type of Sprinklers Should I Use? What type of area are you watering, narrow grass areas, container plants, large expanses of turf? What are your water source limitations? Are you using a well, city or reclaimed water? Is the area you are watering predominately sunny or shady. Or, is it a mixture of both? All of these considerations and more go into a well designed system. For these reasons it is advisable to get professional irrigation design help even if you plan to do the installation yourself. As the name implies, all rotors rotate or turn while they water, anywhere from 90 degrees to a full circle 360 degrees. Each type has its place depending on the unique watering situation. They all are used in watering areas twenty feet or larger and generally have a water throwing distance of forty five feet or greater. Impact rotors work using a bearing and lever that “impact” with the water leaving the nozzle causing the rotor to turn. After the invention of the gear drive rotor, impacts fell out of favor as the tended to collect grass clipping and dirt in their spring mechanism requiring more maintenance. Single stream pop up gear drive rotors have all the gears enclosed in a plastic body leading to greater reliability. They are manufactured by a wide array of companies including Toro, Rainbird, Hunter, K-Rain and Orbit among others. Multi-stream rotors consist of “fingers” of water that rotate out of the head like spokes on a wheel. Multi-stream heads generally have a lower precipitation rate than single stream rotors and work well on dense soils with high run-off properties like clay, on slopes, or anywhere you want to deliver the water more slowly. In recent years multi-stream nozzles have been developed for fixed spray heads which in effect turns them into rotors. More on this below. There are many nozzle patterns to choose from in order to irrigate small, narrow and irregular shaped areas. In recent years rotating fixed spray nozzles have become popular. In situations where rotors and sprays have been piped on the same zone (a big No No) these rotating fixed spray nozzles can be used to even out the precipitation rates as they output water at a closer rate to rotors. 2. Stream bubblersFlood bubblers tend to be chosen to water single plant pots or individual plants or trees. Stream bubblers work better in longer planters as they distribute the water better. 1. Finish watering before sunrise. There are a few reasons for this. One is that the wind is lower and this helps keep the water from drifting out of its intended area. Another is that less people are showering or doing laundry at those hours so if you are on city water your pressure will be greater. There is a misconception that water sitting on grass at night will cause fungus. This would only happen if you watered at night many times in a row and the turf was constantly wet. 2. Don’t water in the middle of the day. A lot of the water will evaporate before it has time to percolate down to the roots. Property addresses ending in even numbers can only water on Thursday and Sunday. Odd addresses can only water on Wednesday and Saturday. Watering is only allowed between 4PM and 10AM. Some commercial properties are granted exemptions from these watering restrictions as the size of the properties renders these water windows impractical. 1. Type of soil. Sandy soil allows water to percolate quickly and lacks the ability to hold the moisture in the root zone. Clay soils are difficult for water to penetrate and often require multiple applications. There are also other types and combinations of soil types that need attention. Basically, the irrigation application should fill the root zone which varies by turf or plant variety. 2. Weather. How hot is it? How windy is it? Sunny or overcast? These conditions affect evaporation rates which affects water penetration to the root zone. What Happens If I Don’t Water My Lawn Correctly? Depending on the type of grass you have, different problems will occur, but there are some commonalities. All life on this earth requires water. You could say water IS life. With too little water your turf and plants will approach what is known as the “permanent wilting point” after which recovery is no longer possible.Look for signs of water stress in your landscape. 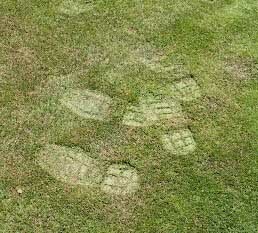 One good way to gauge water stress in your grass is the “footprint test.” Just step with your full weight on a section of your turf. If you can clearly see the outline of your shoe in the grass and the blades do not quickly stand back up, it is time to water. For shrubs you can you indicator plants like azaleas to determine when your other plants are ready for irrigation. Too much water can be just as bad, if not worse than, too little water. Water saturated soil does not allow oxygen get to the plants. A lack of moisture also affects the soils cation exchange capacity and washes out the nutrients required for optimal growth. What Are the Most Common Lawn Irrigation Components? If you have a pump, it will be either a pressure tank system or a pump start system. If you have a pressure tank/switch system your mainline and valves are always under pressure The pump is turned on when the pressure switch records a drop in pressure from a valve opening. If you have a pump start system, your mainline is not pressured until the sprinkler controller activates the pump start which turns on the pump. If you have city (potable) water your water comes from your municipal water meter. Some homes have a separate water meter only for the irrigation. A city water connection requires backflow prevention to protect the municipal water system. Depending on which county you live in Central Florida, the device requirements will change. However it appears that all over Central FL counties are starting to require more stringent backflow codes. The backflow separates the potable home water from the irrigation and is also where you shut off the system. If you live in an area that has reclaimed water for irrigation, no backflow is necessary as potable and reclaim piping do not interconnect. Reclaim water meters are identifiable by their purple lids. The irrigation timer controls your valves telling them on what day and time to open and for how long. The timer or controller is often referred to as the “brain” of the system. If the controller is the brain, then the automatic valves are the “heart.” The valves divide your system into sections or “zones” and do so for a number of reasons. First, generally speaking, most water sources cannot supply enough volume to water the entire property at once. The valves reduce to sprinkler demand into smaller sections. Next, different types of sprinklers precipitate at different rates so they need to run for different amounts of time. Lastly, areas of the property are often zoned into shade versus full sun areas as this also affects sprinkler run times. A rain sensor keeps the system from turning on after a regulated amount of time after it rains. Rain sensors are required by code to be installed on all irrigation systems in Florida. What is a Monthly Sprinkler Irrigation Maintenance Checklist? If lawn sprinkler irrigation is not maintained on a regular basis the system will not perform at the standard is was designed for. Here are some tasks that should be performed on a monthly basis. Turn on and run each zone. Make sure that it has adequate pressure. Low pressure generally signals a pipe break or missing sprinkler head, but in some instances can be due to a failing valve. Make sure all the rotors are turning and check their alignment. Crooked heads can drastically alter the spray pattern. Check spray nozzles for full or partial clogging. Trim landscaping to prevent spray obstruction. Controller should be examined to insure the time and date are correct.